Mixed Esters of Cellulose (MCE) or Cellulose Acetate(CA) are best for microbiology and environment monitoring test. Contrasting grid lines facilitate counting colonies on the filter surface and are tested to assure freedom from grid line inhibition. Membrane Solutions offers sterile membrane discs in diameters of 25mm 37mm 47mm and other diameter, also for different bacteria testing. We have 0.10um, 0.22um, 0.45um, 0.65um, 0.80um, 1.00um for choose. Black membranes are tested for optimal recovery of yeast and total bacteria. Membrane Solutions’ MCE membranes are also tested for freedom from grid line inhibition and optimal color reactions on appropriate test media. Microbiological analysis of water, wastewater, pharmaceuticals and beverages. Small volume field sampling and analysis of fluids or aerosols. Pure Mixed Cellulose Esters (MCE) or Cellulose Acetate: MCE and CA are pure cellulose membrane made for microbiology test. Convenient Package: Membranes are available in box, individually packed, custom labeling. Also it is available in 10-pack. Available with grid lines, wide range of pore size and different colors: Contrasting grid lines are best for colonies counting. 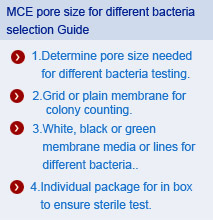 Also wide range of pore size ensure multiple bacteria testing, black and green color are also available. Test for Microbiology: Membrane Solutions’ MCE membranes are tested for free of inhibition of bacteria growth. Available with or without petri dishes.